The unofficial end to summer? A day off? Even growing up in a blue collar home, I never was all that into Labor Day. It usually meant one more barbecue before school started. And what kid wants to celebrate that? And Labor Day always seemed like an outdated holiday. The things that it commemorated: the end to child labor, an eight hour workday, and the right to organize, are often now taken for granted. But having recently read some great historical mysteries set in the era before those changes--Rhys Bowen's Molly Murphy series, and Victoria Thompson's Gaslight series--I've gained a new appreciation for the holiday. I'm rather thankful now, that I'm not in some shirt factory, working twelve or more hours a day, six days a week, for pennies a day and until I could no longer see or breathe. And I'm glad I didn't have to send my child off to do so, and that instead she was able to get a full education. Including college. For those blessings, we need to thank the labor movement, which stood against the combined forces of business and government in a fight that often cost lives. Once labor movements rose to prominence, it added an effective check to the power of government and business. Laborers in union shops could enjoy better wages, benefits, and working conditions. And this drove up wages of workers in non-union shops, health care, and public service, as employers competed for a qualified workforce--and those groups also unionized. The new spending power of these workers sped business along as these workers bought cars, homes, and consumable goods. Yes, health care costs rose, so unions negotiated for more benefits. And taxes went up, but the higher wages paid for them, with enough left over to buy more stuff. And then the companies that made consumable goods had to hire more workers. And it was great while it lasted. I'm not an economist, so I'm not going to theorize on the cause (which I expect is a combination of many factors) but the labor system has developed some serious chinks in its armor. With the downturn of the US economy, and the shipping of blue collar jobs overseas, those great union jobs are few and far between. When one of the Big Three automakers does need workers, hundreds or thousands compete for a single position--which more often than not goes to someone laid off from another location. Now instead of companies having to complete for workers, a highly trained and educated workforce competes for fewer and fewer jobs with less pay and lower benefits. And the taxes and health care that were once just a cause for grumbling, are now a heavy burden for someone working minimum wage. And minimum wage is often a burden for small companies struggling against products shipped in from overseas. Yes, universal health care would help those struggling with low paying jobs, but someone must absorb the costs. Should it be the already strapped taxpayers? Struggling business? Or government already endangered by the burgeoning national debt? Some have suggested solutions. 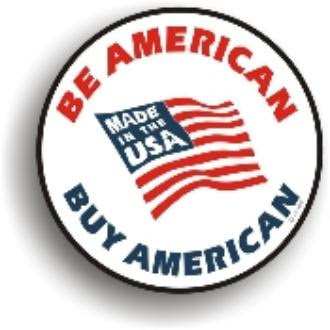 The latest "Buy America" campaign among them. 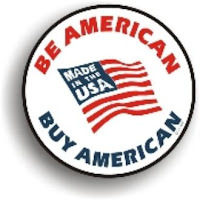 The jury is still out whether those earning the least money will feel compelled to buy American products such as cars, to support workers who often earn three times their hourly wages--or if they will buy the product that most inexpensively meets their needs. The answer to that question may be seen in a recent Gallup poll that shows that the US public's approval of labor unions, while still a majority, is at an all-time low, while disapproval rates are rising steadily. Meanwhile government and labor also struggle, most notably in Wisconsin, where today's holiday was marked by an attempt by labor to exclude GOP leaders from participating in annual parades. There, recent anti-union laws have stirred controversy, while the government has required that many public workers, teachers among them, pay a larger share of their own health care costs--a move already taken by many businesses. I don't claim to know the solution to these complex problems. But I do know the solution to the anxiety these issues cause. Psalm 37:25 says I have been young, and now am old; yet have I not seen the righteous forsaken, nor his seed begging bread. Whatever happens to the economy, we have a God who holds us in the palm of his hand, and to whom we can go for all our needs. And his storehouses are never empty. Questions for discussion: What was your first job? Do you have anything special planned for Labor Day? Barbara Early grew up buried in the snowy suburbs of Buffalo, NY, where she developed a love for all things sedentary: reading, writing, classic movies, and facebook scrabble. She holds a degree in Electrical Engineering, but her penchant for the creative caused her to run away screaming from the pocket-protector set. She taught for several years in a Christian school before home schooling her daughter successfully through high school. 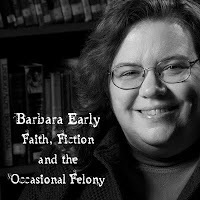 Barbara cooks up cozy mysteries with a healthy dose of comedy and sometimes a splash of romance, and was a double finalist in the 2010 ACFW Genesis competition. Her holiday novella, Gold, Frankincense and Murder will be released from White Rose Publishing in time for the holiday season. You can learn more about her writing on her personal blog: http://barbearly.blogspot.com/ or see what's for dinner on her recipe blog: http://bflogal.blogspot.com/. Every year my quilt guild has a quilt making challenge and, after we all enter our quilts and see who got the prizes, the quilts are donated to our local children's home. I've been so busy, I didn't start mine until today, but I'm hoping to actually get it done this year. I've missed the deadline the the last two or three years. DeAnna--Sounds like a good use of the Labor Day--Labor! I'm off to try to finish one last run through on my galleys this morning. Then my daughter is coming for a rather cool and rainy picnic. So a very low-key day for us. Labor day always means school tomorrow here, and often coincides with my husband's birthday, as it does this year. We'll be going to the beach and then having family over for a Lebanese style BBQ. My first real job was life guarding at pool. Not bad, although it's really just glorified babysitting. Dina, at some point you'll have to share what one serves for a Lebanese style BBQ--sounds interesting. And I imagine lifeguards are glorified babysitters only until they're needed. No plans. Hubby is headed to work anyway, so I think I'll try to get my writing life organized and activated again! First job? Gift wrapping elf at Christmas in the local toy store. s soon as I could drive I took a newspaper delivery motor route from my folks that had me up every day at 4 a.m., seven days a week, year round. Lebanese BBQ is basically Lebanese food like tabouli, humus, etc... but you cook the meats on the grill. Summer has finally arrived here! We've had three sunny, over-70-degrees days in a row! My first job was cleaning a church building once a week. No big plans here...we are staining a small coffee table cranberry red. It'll serve as a lego table for Kid #2's room. My first paycheck was a factory position. TORTURE! two nights a week and Saturdays while I was a senior. But I learned something worthwhile doing that. Labor Day is picnic fair at my house as well, and generally a birthday celebration and farewell summer! But I'm usually ready for fall by now. Oh, Deb, I am never ready for fall because we don't have lovely fall weather here. We might have a week of that crisp air with sunshine and pretty leaves, but then it's rain, dark gray skies and so much wind. Hey, kind of like our spring and summer with a few nice days sprinkled in. I got to ride the train from Virginia to Seattle in October a few years ago, and I have never seen leaves so gorgeous as I did on that side of the Mississippi. Lovely.